Jewish Home head rips Prime Minister: 'Instead of putting out alternatives, like Jewish sovereignty, we've gone back to two-state solution'. 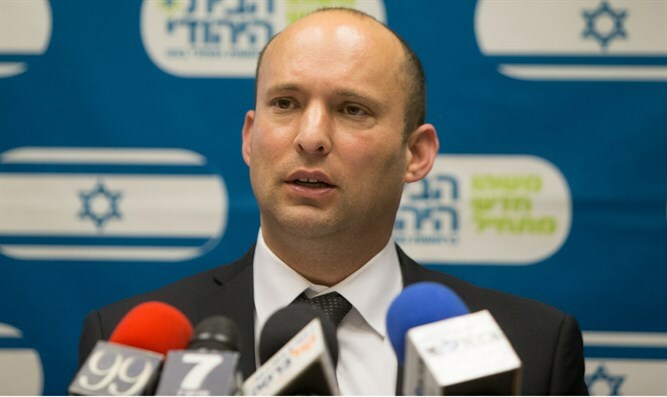 Education Minister Naftali Bennett criticized Prime Minister Binyamin Netanyahu on Sunday, slamming Netanyahu over what called a “missed opportunity” to change the direction of US-Israel relations. Earlier on Sunday it was reported that the Prime Minister had presented the cabinet with a package of good-will gestures for the Palestinian Authority. Last Thursday, Netanyahu also presented the Security Cabinet with plans to construct a new town in Samaria – the first officially sanctioned town to be built by Israel in Judea and Samaria in more than 20 years – along with restrictions to limit expansion out of town limits by Jewish communities in the area. But in a follow-up post Bennett lamented another aspect of Netanyahu's talks with Trump, what he termed a “missed strategic opportunity,” arguing that the Prime Minister failed to present the new White House with alternatives to the two-state solution. Bennett emphasized that he did not blame President Trump for the unchanged paradigm.